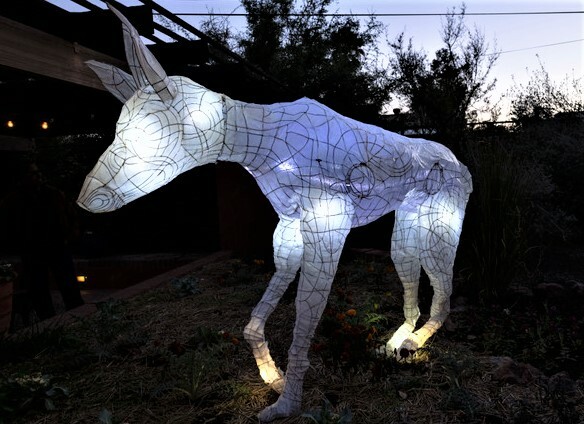 This fantastic, larger-than-life size coyote is on the prowl at the Tucson Botanical Gardens. The coyote is part of a exhibit designed and created by local artist Mykl Wells. The sculptures are scattered throughout the grounds - both placed on the ground and some are suspended from the trees. 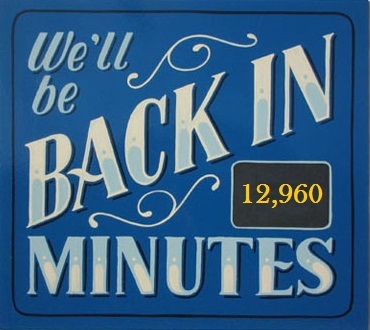 It is a magical show that ends on January 6 so hurry! 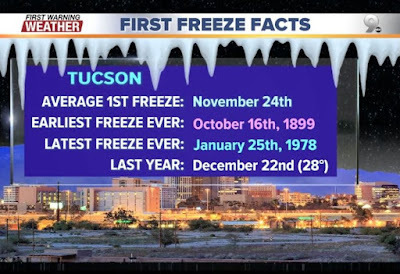 It's officially COLD here in Tucson! Oh boy is it ever - down into the 20's! What is this - North Dakota or something? Here's the scoop. Fun, Festive, and FUNCTIONAL, too! 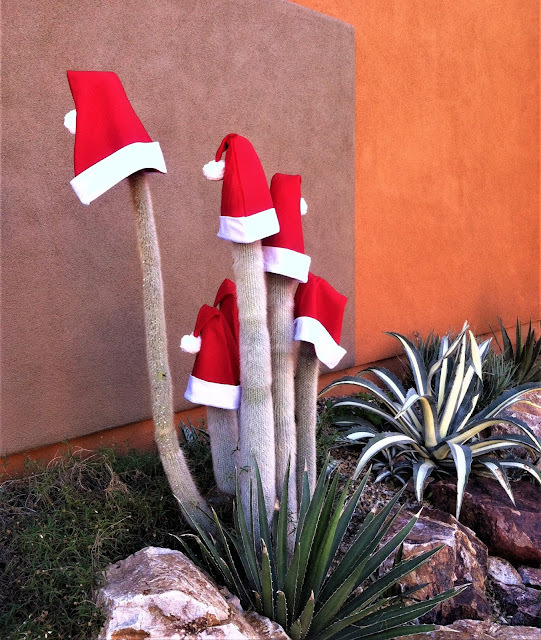 You see cactus all around Tucson decorated with Santa hats (or sometimes just plain old styrofoam cups). Not only is this a fun and festive holiday "look" but it also is practical. The hats/cups help to prevent the tops of the cacti from freezing. And last night's temperature was 27 degrees! YIKES! 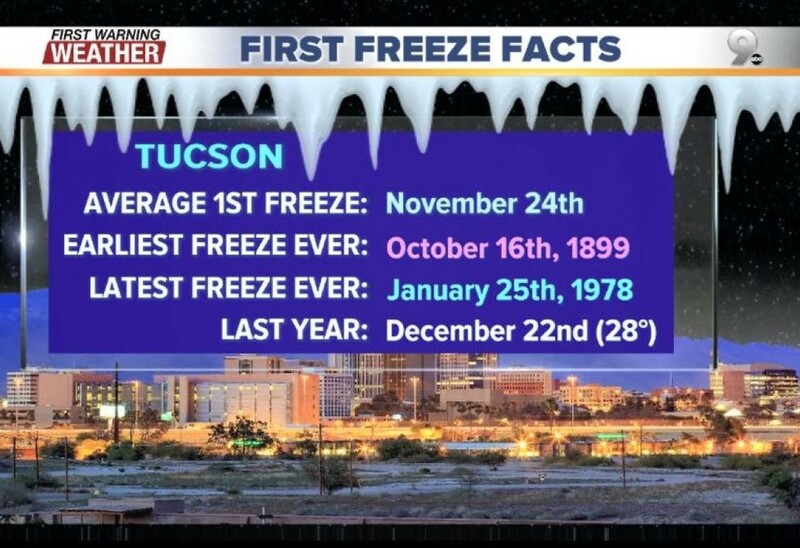 Is this really Tucson's weather? 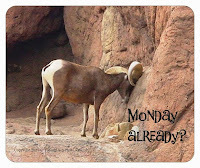 Yep, right now it sure it. Brrrrrrr. How many eyes can you spy? How many eyes can you spot? These brown owl eye butterflies are so beautiful and so cleverly disguised! 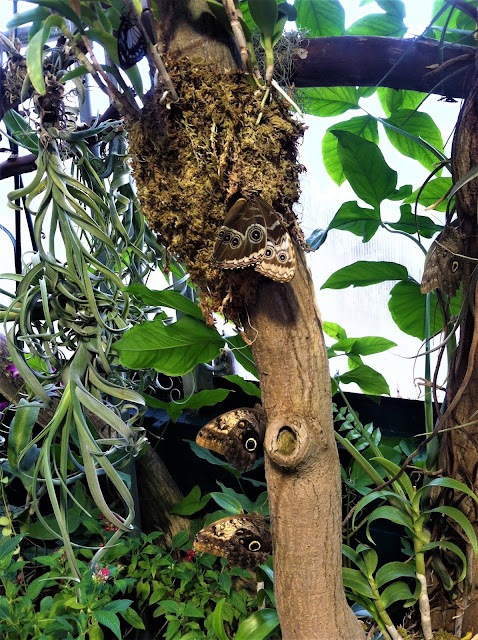 This is part of the Tucson Botanical Gardens' Butterfly Magic exhibition. Incredible, isn't it? 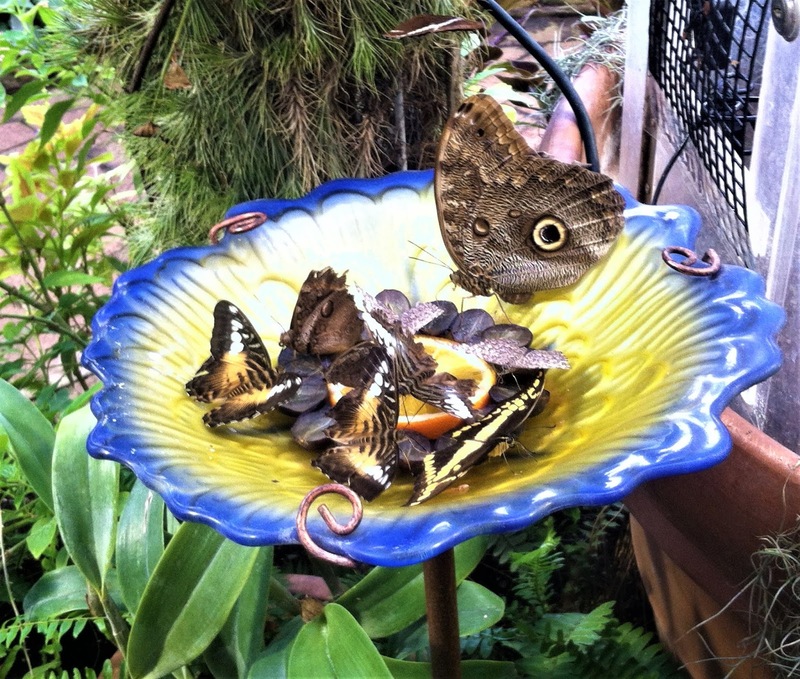 A bowl full of butterflies feasting on an orange slice. The large one is a Brown Owl Eye Butterfly. Anyone able to name the smaller ones? Is there a lepidopterist in the house?? If you haven't visited the magical butterfly exhibit at the Tucson Botanical Gardens I hope this photo will inspire you to go! 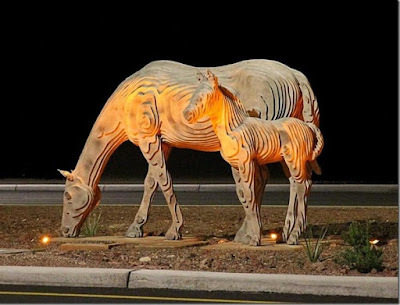 Today you see another angle and another type of lighting for the wonderful Mare and Foal sculpture on Houghton Road. Yesterday's view was full-on daylight (with Santa hat!). Here you see the pair lighted at night. They glow! 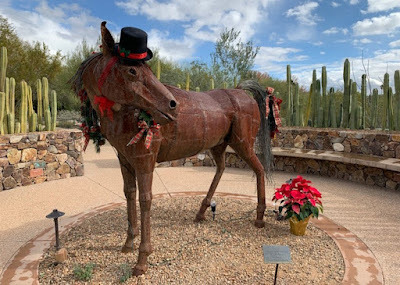 I'm reposting this photo from December, 2016 because this year no one decorated the foal for the holidays (or, SIGH, someone stole the hat). Hope your day is filled with friends, food, and festivity! 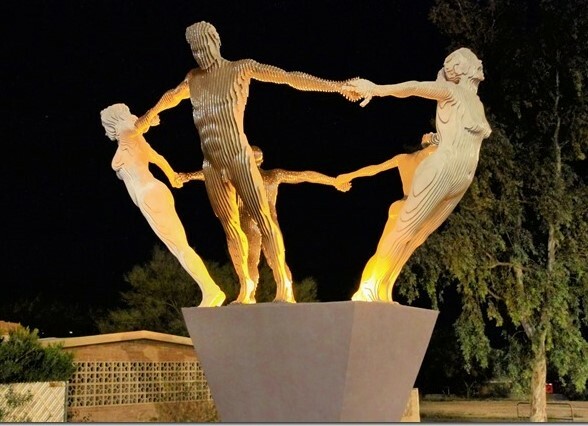 This is one of my all time favorite pieces of public art/sculpture in Tucson! A grazing mare and her sweet foal reside in the median on Houghton Road just north of Old Spanish Trail. And you have to love that someone gave the little foal a Santa hat!!! Artist team was Lauri Slenning, Ben Olmstead, and Simon Donovan. Here are some critical items to prepare in advance for a proper New Year's Eve home party - sugar cones. These sugar cones have to dry out completely before they are slipped out of their molds, positioned over a simmering vat of feuerzangenbowle, soaked with overproof rum (or brandy) and set alight. WOW! Delicious & festive!! Cheers! 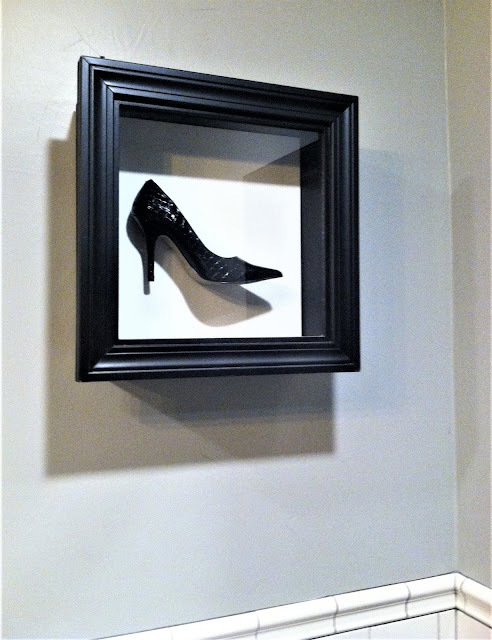 This nicely framed black stiletto serves as wall art in one of my favorite restaurant's ladies room. Care to guess where this is? What do you think this pup is thinking? Christmas 7 years later - always fun! Then & Now: Mesquite Valley Growers has expanded enormously since this posting. They even have a gardener's gift shop! They still create a fun holiday display outside and this year it is just a wagon, I think. Not at all as fun as these Javelina-deer from 2011! Enjoy! In the last week I've been posting the different kinds of Santa's helpers that are all over town. Let's see, we had a cow-deer, a buffa-deer and now we have javelina-deer, flamingo-deer, and stork-deer! 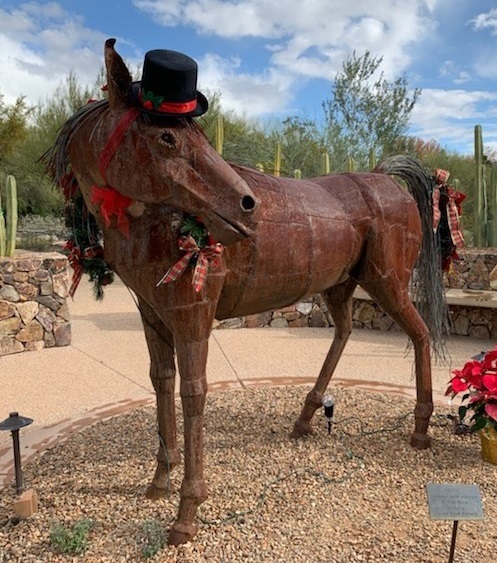 A site follower from Sahuarita alerted me to this incredible Animal Sleigh in front of Mesquite Valley Growers. How about that javelina Rudolph?? FUN! You can see this sculpture, "Unity," at E Grant Road and N 3rd Avenue. The scultptors, Simon Donovan and Ben Olmstead, created this using parallel steel plates that give the sculpture a light, almost invisible quality as you circle it. 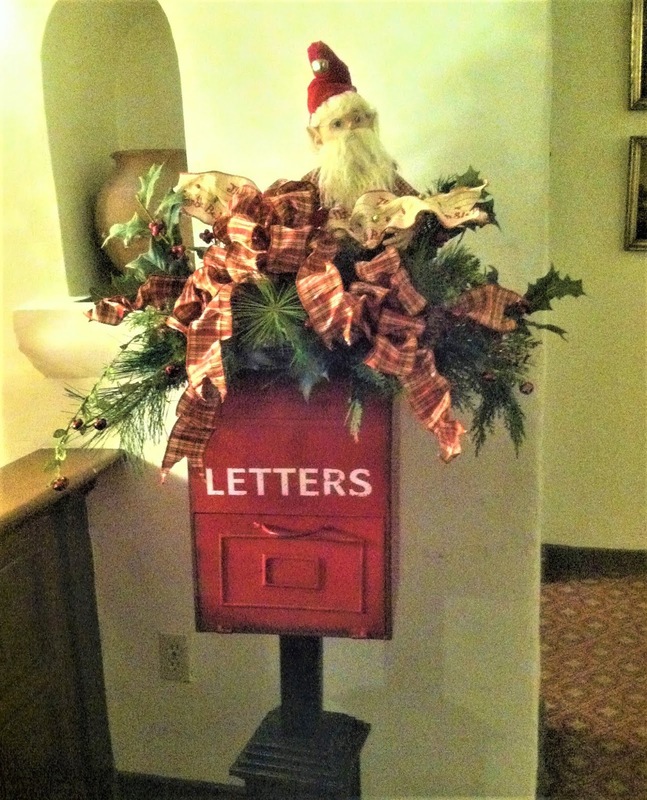 Looks like the Arizona Inn has established a direct mailbox to Santa. Good to know in case you haven't sent him your wish list yet! This is the time of year to visit the Arizona Inn! The ceiling-scraping tree in the library is always lovely to behold and they do their best to create a wonderful holiday ambiance. It's a BIG BARK day! My birthday! 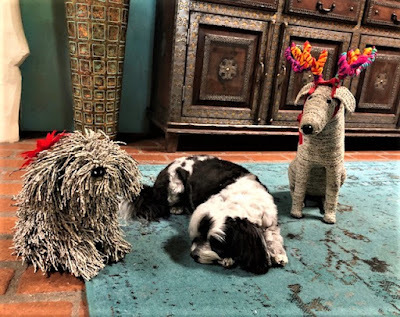 Having a December birthday is really great - everything is decorated and festive everywhere you go. 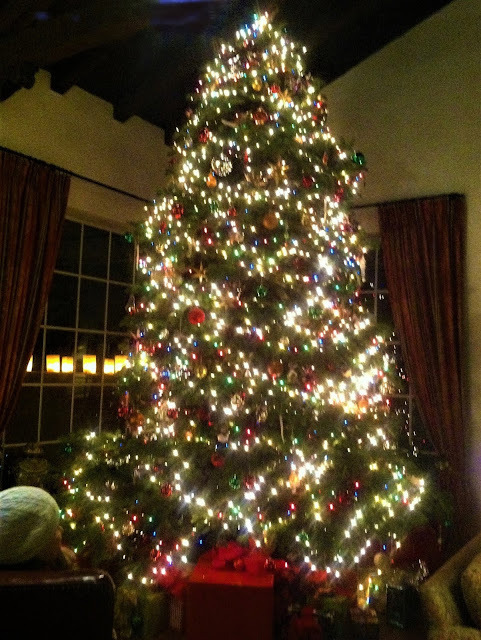 Sparkly lights! Fun! Happy day! Yes, you know ALL the songs! 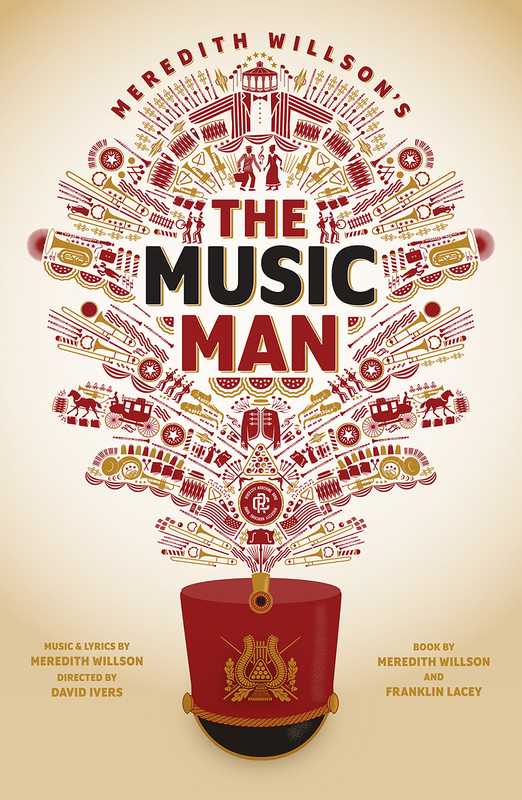 From "76 Trombones" to "Till There Was You"and "Gary, Indiana," you will tapping your toes and humming along throughout the show. A fun evening - especially the women's costumes! For ticket information, click here. Who Who Who's Ready for Christmas? 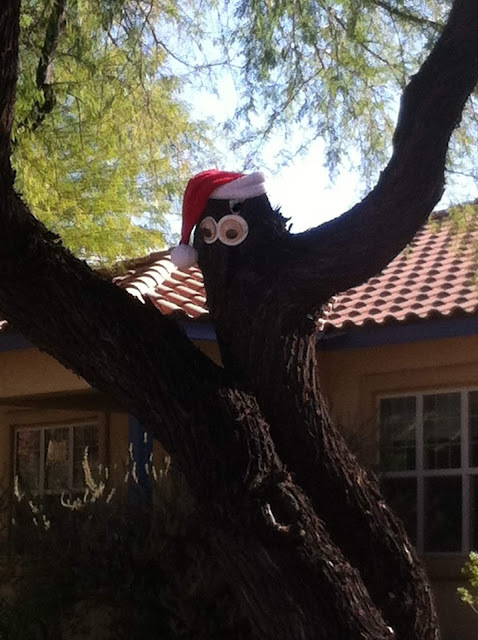 When the Santa hat appears on our neighborhood owl, it's getting pretty close to Christmas! 9 years later - STILL miles of aisles! THEN & NOW - 9 years later and it's exactly the same! It's hard to believe that a home improvement store can offer "one stop shopping" for Christmas decorating but here you go... buy your tree, your holiday lights (indoor and outdoor), lawn decorations (twinkling reindeer, illuminated polar bears) and save room in the cart for poinsettia in red, white, and pink. Happy shopping! Happy decorating! Why we love living in Tucson! 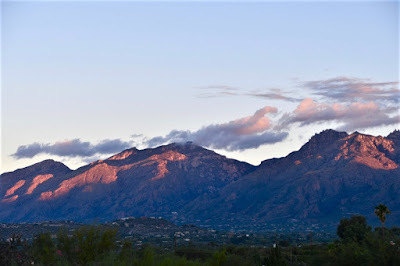 Captured here is a beautiful sunrise touching the Catalinas. I hope this helps you start your day in a beautiful way! 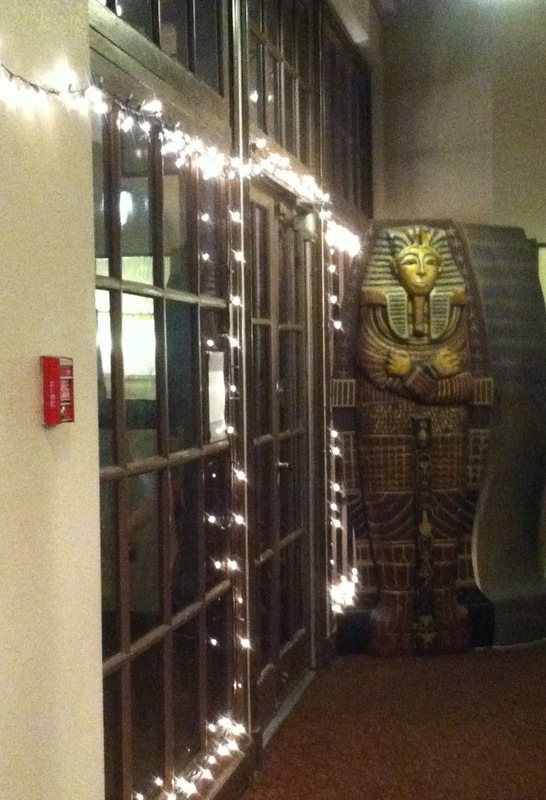 Tucson Trivia ~ Holiday Style! OK - But which half? Nothing says "Christmas in Tucson" better! Nothing tells you that it's Christmas time in Tucson better than this - Santa hats on the saguaro! Ho, ho, ho! These graceful dancers definitely added some sparkle to the party! I was a party guest where the Belly Dance troupe entertained and did a quick lesson, too! How fun! Here's their info to learn more. They were wonderful! The season has started! 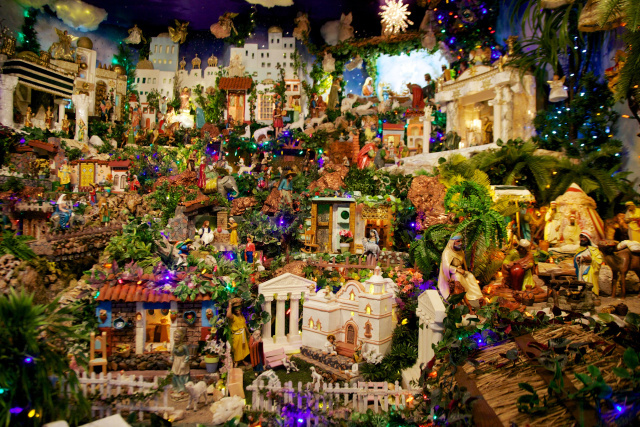 Tucson's beautiful Tohono Chul Park is getting ready for the holidays! 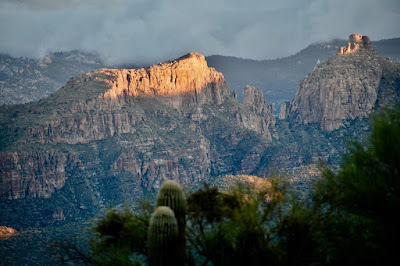 Photo courtesy of Susan Dodson, Tucson realtor extraordinaire and generous Sponsor of this site! 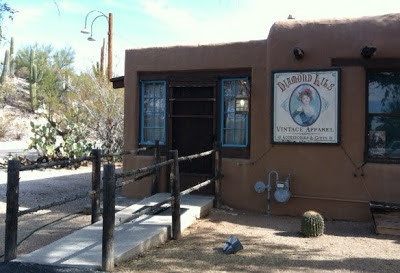 This is a wonderful store that is on the grounds of hte famous El Corral restaurant - so it's a little hidden from view. "Diamond Lil's" feataures vintage clothing and jewelry. I can't find a website for t hem but I did find this basic info on Yelp: 2201 E River Rd, Tucson, AZ 85718; Open Wed-Sun 3pm - 9 pm. 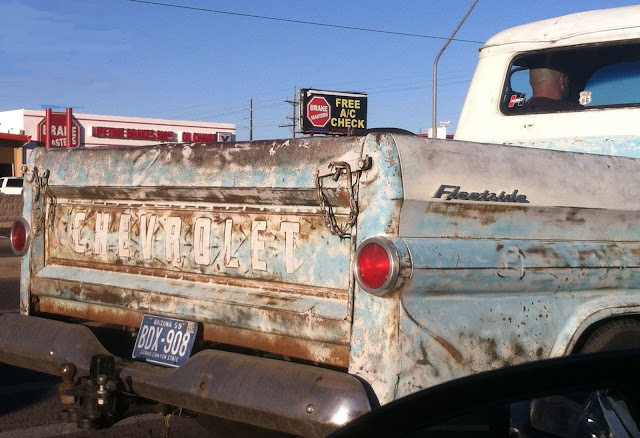 This truck is so rusted it has a style all its own! Repair Shop Visible from Space! 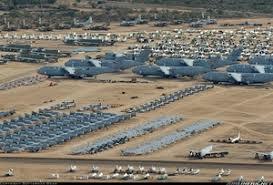 According to Guinness World Records, Tucson's Davis-Monthan Airforce Base (known locally as DM) has the largest aircraft repair shop and storage facility on Earth. This mighty "shop" covers almost 3,000 acres and stores 350,000 tools. AWESOME way to start the week! We never get tired of Tucson's mountainous beauty. This is a sunrise capturing a magnificent view ~ WOW! Have you ever seen a long-horned steer with so much BLING? This fellow is on display at El Corral Restaurant (River Road). Sparkly! 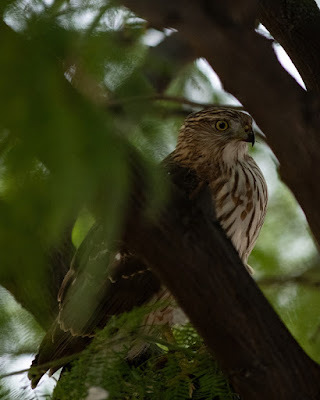 A tree in my front yard was this Sharp Shinned Hawk's picnic area. I didn't really want to investigate exactly WHAT was being ripped apart! To learn more about these birds - including listening to their call - click here. 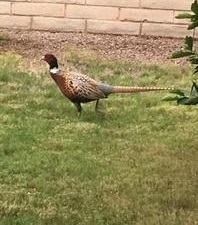 This beautiful ringneck pheasant was spotted wandering around in a neighbor's backyard. It was not afraid of humans so it is speculated that this beauty was someone's pet and it made its escape. What a gorgeous bird! Photo courtesy of John Ewing. THEN & NOW: Some things never change! A Tucson watering hole since 1963, the Kon Tiki Lounge serves a drink they call the Scorpion: "the largest drink in the world." It's a mix of rum, brandy, gin, fruit juice, and liqueurs ~ whew! And they serve it in a giant bowl with extra long straws. Quite a cocktail! I've never been brave enough to try it but do tell me if you have! Although I do like the alliteration of "Bevy of Bats," it is incorrect. I have read that a group of bats can be called a Colony, a Camp, or a Cloud. 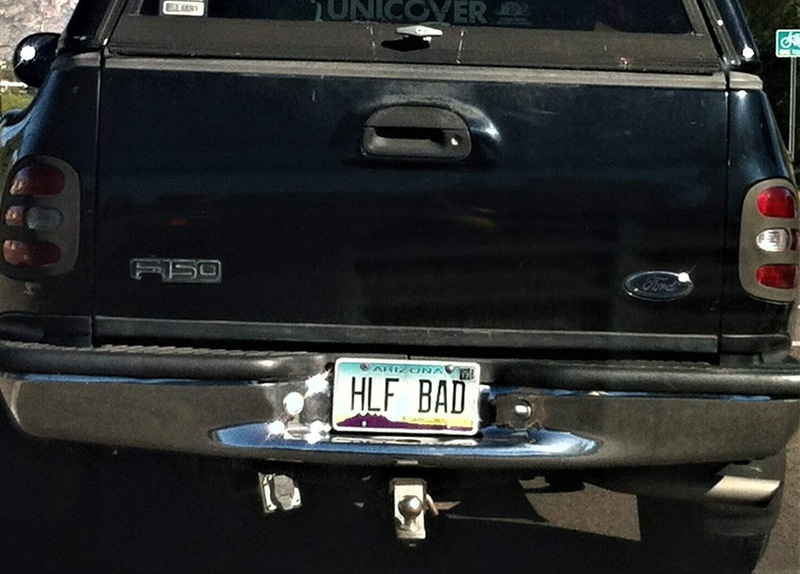 Doesn't sound quite as snappy, though, IMHO. 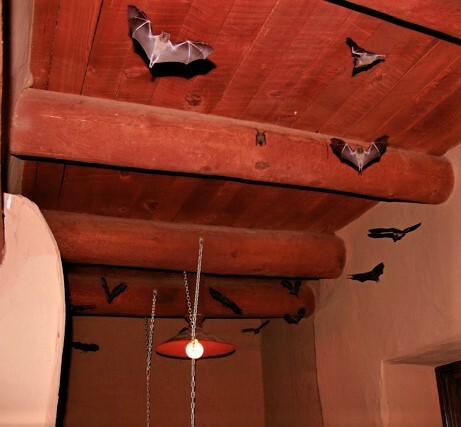 (: Are there more bats visible at this time of year or are we just more aware of them during this ghoulish season? Here's a great photo of a Tucson crowd waiting for the arrival of the Rodeo Parade. 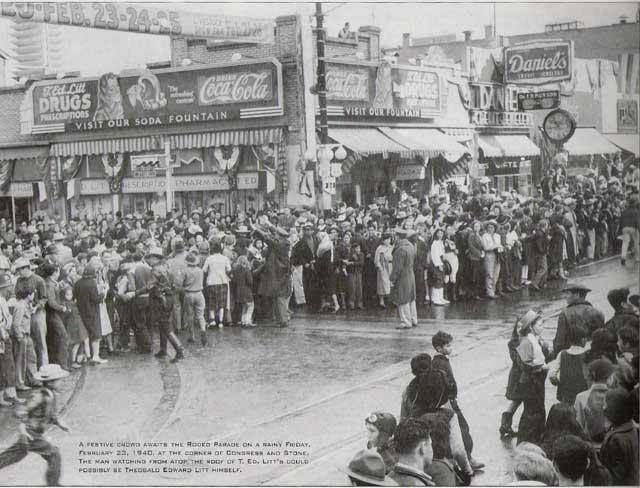 This is at the corner of Stone and Congress, northeast corner. In my mind's eye I think that corner is a bank now. Anyone know for sure? Next time I am downtown I will look. Here is the set for Arizona Theatre Company's current production, "Native Gardens" at the Temple of Music and Art. 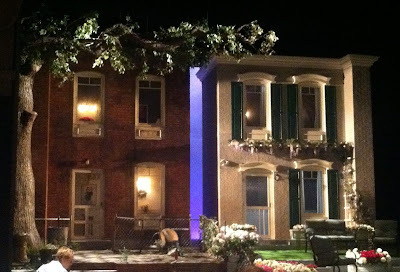 For more info about this play, click here. 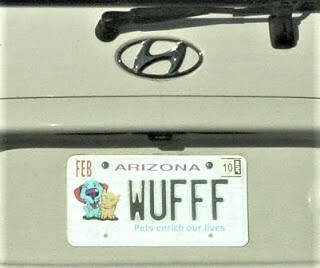 Anyone care to guess where I spotted this Tucson Tut? Here is another scene from the Tucson Botanical Gardens' railway town, Thorneville. Departing the church on the left is a happy couple who just celebrated their nuptials. The minister can now walk next door and conduct a funeral for whomever is in that hearse! 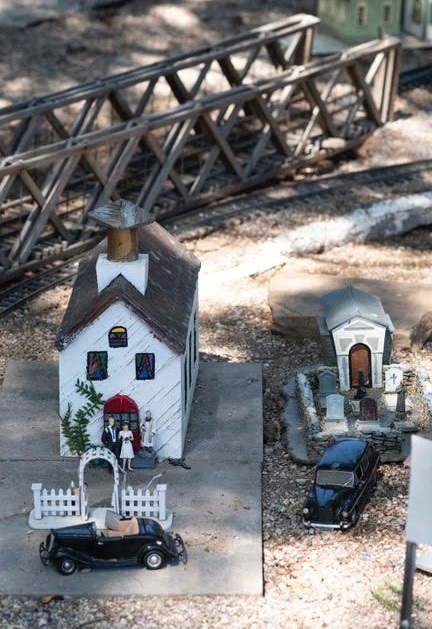 Did you know that the Tucson Botanical Gardens has a village complete with railroad station? 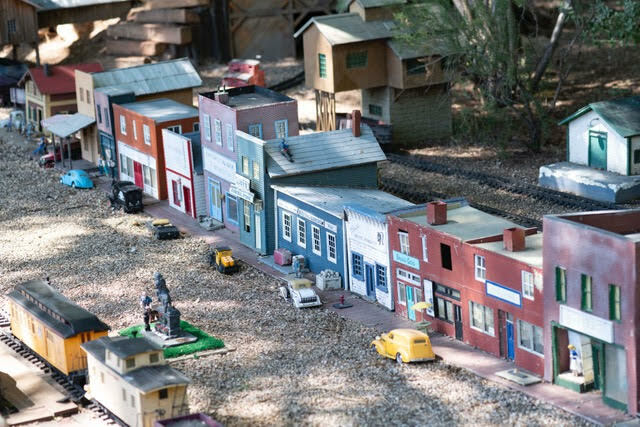 This charming feature, "Thorneville Garden Railway," was the brainchild of Thorne Pierce and Gary Martin and was dedicated in 2008. Fun!